On board with Celebrity Cruises, contemporary design, sophisticated venues and warm spaces combine to offer an experience that truly brings the idea of luxury to life. Celebrity Cruises launched in 1989, taking the very best aspects of cruising and giving them a modern makeover – and with this premium service comes refreshingly great value. 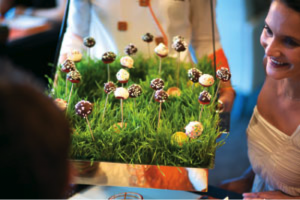 Celebrity Cruises embodies classic, elegant cruising with a modern twist to meet the demands of today’s traveller. Celebrity’s Solstice Class ships exemplify Celebrity’s emphasis on designing stunning ships and inviting onboard experiences for vacationers who appreciate the finer things. The ships have taken stylish cruising and impeccable service to new heights. Celebrity Solstice set sail in 2008, Celebrity Equinox in 2009, and Celebrity Eclipse in 2010. All three hold 2,850 guests (double occupancy) and have a tonnage of 122,000. Celebrity Silhouette debuted in 2011, and Celebrity Reflection debuted in 2012. 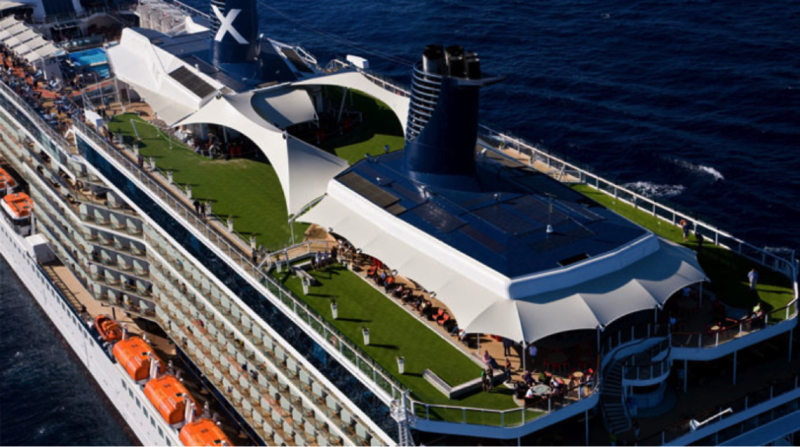 Celebrity Silhouette holds 2,886 guests (double occupancy) and has a tonnage of 122,400. Celebrity Reflection holds 3,030 guests (double occupancy) and has a tonnage of 126,000. Celebrity’s Solstice Class features the industry’s first “Lawn Club” – an outdoor, country club-like venue featuring a lawn of real, growing grass where guests can practice their putting, play lawn games like croquet and lawn bowling, or simply relax under the sun and stars; the first Hot Glass Show at sea, presented in collaboration with The Corning Museum of Glass; and a slate of breathtaking new shows created in partnership with POET Theatricals. The Solstice Class also offers larger, more intuitive staterooms influenced by “Celebrity’s Leading Ladies,” five Boomer women with unique travel and hospitality insights. The new ships present fewer inside staterooms than other ships – 90% of the ships’ staterooms offer outside views and 85% of staterooms have verandas – and feature an entirely new category of staterooms, “AquaClass,” designed with spa enthusiasts in mind, offering a host of exclusive amenities. AquaClass guests enjoy unlimited access to the spa’s Persian Garden, located in the two-story AquaSpa by Elemis, as well as priority seating in Blu, a specialty restaurant with healthy dishes created exclusively for AquaClass guests. 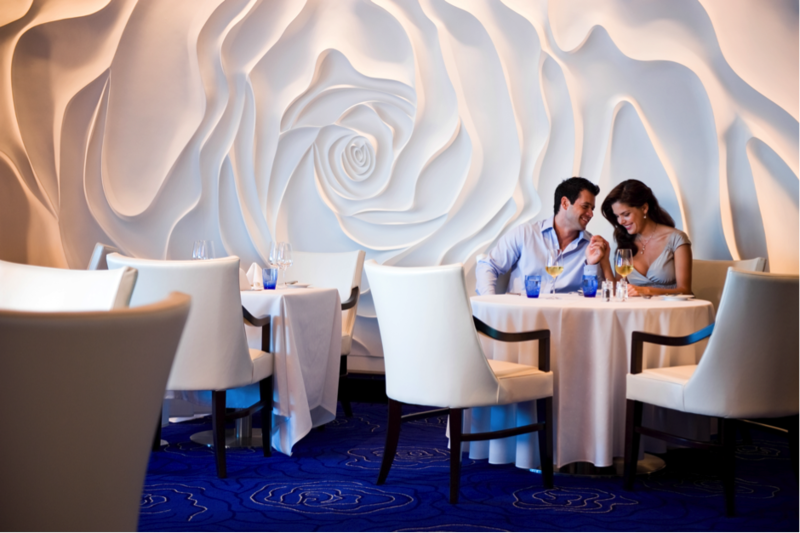 Fantastic dining comes naturally to the ships in the Solstice Class. From the grand Main Restaurant to the laid-back style of the Tuscan Grille, there is always an option for everyone. The choice of cuisine is as varied as the destinations on your itinerary, with inspiration taken from cultures the world over. A perfect example is Silk Harvest where the essence of Asian cooking and service comes together. The Millennium Class is stocked with ships each as charismatic as the last. 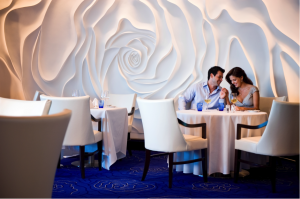 On each one, you will find entertainment and dining venues to make your cruise truly unforgettable. On board the Celebrity Constellation®, Celebrity Infinity®, Celebrity Millennium® and the Celebrity Summit® we have optimised the experience to make sure you are catered for in every way, wherever you are travelling to in the world. Stay connected and learn new skills in the latest technology at Celebrity iLounge Oceans Ahead – Behind the Scenes and invest in some cutting-edge technology yourself at the Innovations Store. To escape from the stresses of everyday life, come on board as an AquaClass® guest or enjoy the various exceptional spa facilities. Add this to bars and venues with the perfect view of the sunset and Millennium Class cruise is guaranteed to be unlike anything you have experienced before. The dining options aboard each ship in the Millennium Class are brilliantly broad and varied. Each ship delivers the same impressive quality and value when it comes to eating out, with venues like the vibrant Tuscan Grille and interactive Qsine designed for contemporary, smart casual dining. More formal evenings occur in venues like the Main Restaurant, which offer dishes and décor that are as grand as one another. Follow up a decadent dinner with a post-meal drink at the intimate Cellar Masters. Lighter fare is available too – head to Bistro On Five for relaxed French dining that is perfect at any time of day. Cruising the Galapagos Islands, your experience will be defined by the onboard ambience as well as the natural wonders passing by outside. Each area of Celebrity Xpedition offers its own unique atmosphere and activity. From the peace of the Library to the serenity of the sauna and hot tub on the sun-soaked Sunrise Deck, and to the spectacular views from the characterful Blue Finch Bar on the Panorama Deck. See the popularity of the Discovery Lounge – a place where evening ambience and education come together. As well as serving as a great place to meet up, the Discovery Lounge also hosts a number of naturalist-led nightly lectures, which will prepare you for the unique creatures waiting for you to discover on the incredible Galapagos Islands.